Brisbane, Feb 22, 2018 AEST (ABN Newswire) - OtherLevels Holdings Limited ( ASX:OLV) ("OtherLevels" or the "Company") today releases its results for the half year ended 31 December 2017. - 51% increase in revenue to A$2.39m for H1 FY18, from the prior corresponding period in FY17. - 66% increase and record customer receipts of A$2.7m (excluding R&D) from H1 FY17. - 78% improvement in EBITDA to a loss of (A$647k) from a loss of (A$2.98m) in H1 FY17. - 58% improvement in NPAT to (A$1.49m) from a loss of (A$3.5m) in H1 FY17. - 22% decrease in cash operating and investing costs through continued focus on cost management. - 77% improvement in net operating cashflow to (A$0.6m) from (A$2.75m) in H1 FY17. - Q2 FY18 saw the company's first quarter of positive operational cashflow. The first half of FY18 saw the company achieve cash receipts of A$2.7m. Results for this half year were partly impacted by the first quarter of the financial year being a historically low billing period given it corresponds to the holiday season in the UK, our largest market. There was continued increase in sales activity with 8 new customers signed. Highlights include a major European lottery, a UK/Australian wagering company, the leading UK consumer choice brand and a top 3 Spanish wagering operator. In addition, the average new deal size increased to A$108k in the half year, reflecting a trend of higher value engagements. As a result, total revenue grew by 51% for the six-month period including a 59% increase in licence revenue and 37% increase in service revenue. The licence/service revenue split for the period was 68%/32%, which is consistent with prior periods. OtherLevels continues to experience strong growth and demand in the UK and European markets driven by an experienced sales team. The Company's focus on the wagering sector within these key markets continued to attract new customers, as well as maintain our existing customer base. The Company is also focused on taking advantage of increased opportunities through the "In-Play" market. OtherLevels' presence in this market is significant and continues to expand, as evidenced by over 40 customer and prospect meetings following the launch of the Company's In-Play Messaging Offering at the February 2018 ICE industry conference in London. The UK and European markets now constitute 72% of total revenue, with US and Australia comprising the balance, contributing 10% and 18% respectively. With the ever-increasing digital marketing and customer acquisition plans from major current and potential customers, OtherLevels is strategically very well placed to capture an increasing share of this business. To further grow through new market acquisition, the Company continues to develop strategic partnerships with leading complimentary marketing platforms to increase distribution channels and reduce cost of sales. Examples are the integration with the artificial intelligence platform Amplero and the OtherLevels AppExchange plug-in for SalesForce Marketing Cloud. Expanding and leveraging these partner opportunities, continues to be a focus for OtherLevels in 2018. Continued commitment to cost and expense management has seen operating and investing cash outflows decrease year on year. H1 FY18 saw a reduction of $1.1m or 22% from the prior corresponding period. OtherLevels continued to expand and innovate the OtherLevels platform during the period. There was continued new product adoption from a number of large clients, which is expected to convert into higher value renewals in 2018. OtherLevels maintained its focus on real-time messaging, which ensures that recipients receive messages at the most engaging moment. Examples include "abandoned cart" messages from ecommerce sites, location based messages triggered by geographic proximity, wagering message offers during a game and alerts for hotel inventory, or flight prices. The OtherLevels platform support for real-time messaging includes OtherLevels Intelligent Messaging, Location Messaging and Event Messaging. OtherLevels launched further capabilities in this area for the wagering sector, in the form of In-Play Messaging in February. In-Play Messaging is a premium high-value product, priced in excess of A$250,000 per annum per customer. In summary, the above performance reflects the continued momentum on sales growth and cost management during the 2017 year. The Company remains focused on taking advantage of the continued shift in enterprise marketing spend to digital channels. In the last few months of 2017, the Company signed a number of new clients, and has a strong and growing pipeline of opportunities. The OtherLevels strategy of delivering a leading enterprise marketing automation platform with deep, high value, long-term relationships with its clients remains unchanged. 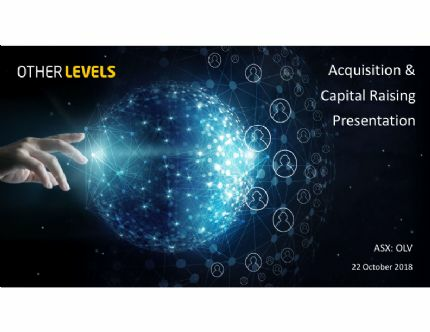 OtherLevels will continue its "broader and deeper" strategy with existing customers and focus on acquiring new enterprise grade clients in targeted sectors. The Company's Board and management remain committed to successfully monetising OtherLevels' valuable proprietary messaging platform in global markets through increased sales and maintaining strong operational cash flows in H2 2018, although note that cyclical factors may impact the performance of individual quarters. 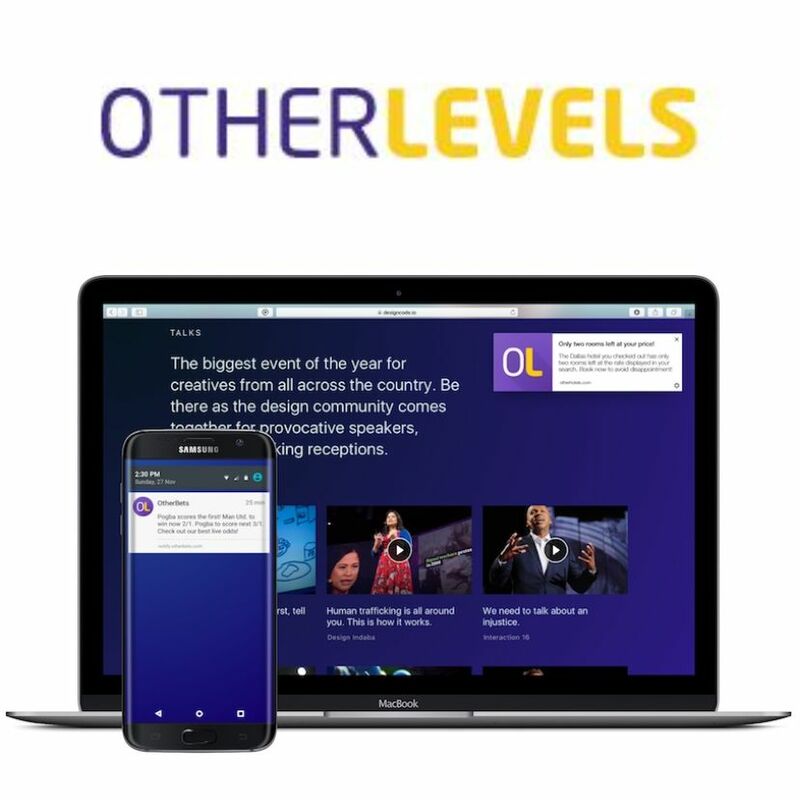 OtherLevels Holdings Ltd (ASX:OLV) (FRA:7OL) is a leading second-generation digital marketing platform with offices in Europe, the US and Australia. The OtherLevels platform enables clients to acquire sooner, engage smarter and retain longer across desktop, mobile web and apps audiences. The OtherLevels platform offers both Intelligent Messaging for Conversion, and Intelligent Messaging for Marketing Clouds and CRM, hence delivering both acquisition and engagement capabilities for digital marketers. OtherLevels leading clients include Camelot (UK), Tatts/Tabcorp, Coles, Flight Centre, IHG, LadbrokesCoral, Betfred and Doubledown. For more information, please visit http://otherlevels.com. For media enquiries please contact media@otherlevels.com.